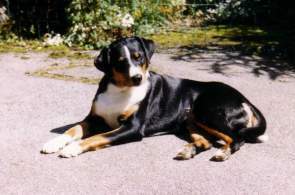 The Appenzeller Sennenhund, also called the "Appenzeller" or the "Appenzell Mountain Dog", is a medium-large sized breed that hails from Switzerland. It is muscular and solidly built, and has served in a number of working roles in its time. The breed is loyal, friendly, and will share a close bond with its owner. It does however require an owner capable of taking a pack leader stance and giving it the exercise it needs. These dogs love open spaces and should not be kept in apartments. 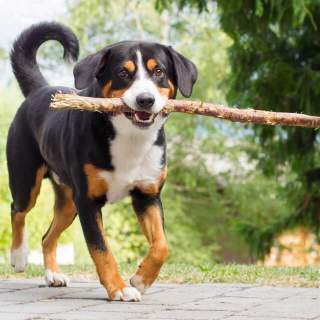 If given a working role this intelligent dog will flourish and make every effort to do its job well. Males reach a height of 22 - 23 inches and females are slightly shorter, reaching 18 - 20 inches. As adults these dogs will weigh between 49 - 70 pounds. Their size and musculature makes them hardy and resilient, and they are also well-suited for guarding and herding purposes. This breed is hard-working and very intelligent. It is good with children and families assuming that training has taken place and a pack hierarchy has been established. Appenzells get along well with other dogs and should be fine with smaller pets as long as socialization occurs at a young age. This dog is considered a medium maintenance breed. Their coat will not need a tremendous amount of grooming; 2-3 times a week should be fine, though it may need more during shedding season. 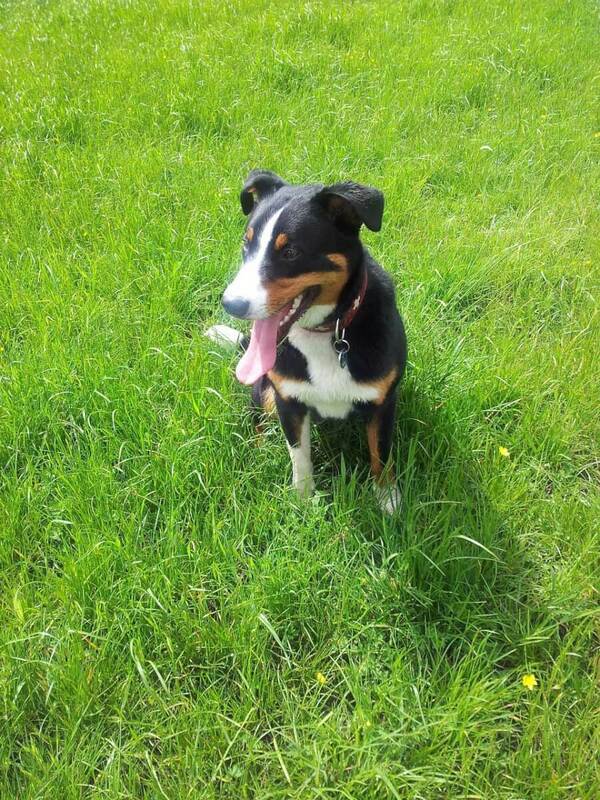 These dogs are active and require an active owner able to keep up with their demanding exercise requirements. 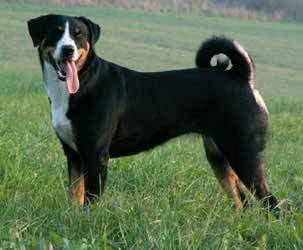 The Appenzell Mountain Dog may have originated in one of two ways. The first theory is that it descends all the way back to the Bronze Age. The second theory posits that it descended from the Molossus and was introduced to Switzerland by the Romans. In any case it is known to have developed in the Appenzell alpine region in Switzerland and it is the rarest of the four Swiss Sennenhunds, remarkable for its versatility as a working dog. It has been used as a herd dog, a guard dog, a cart-puller, and of course it has also been a charming companion. 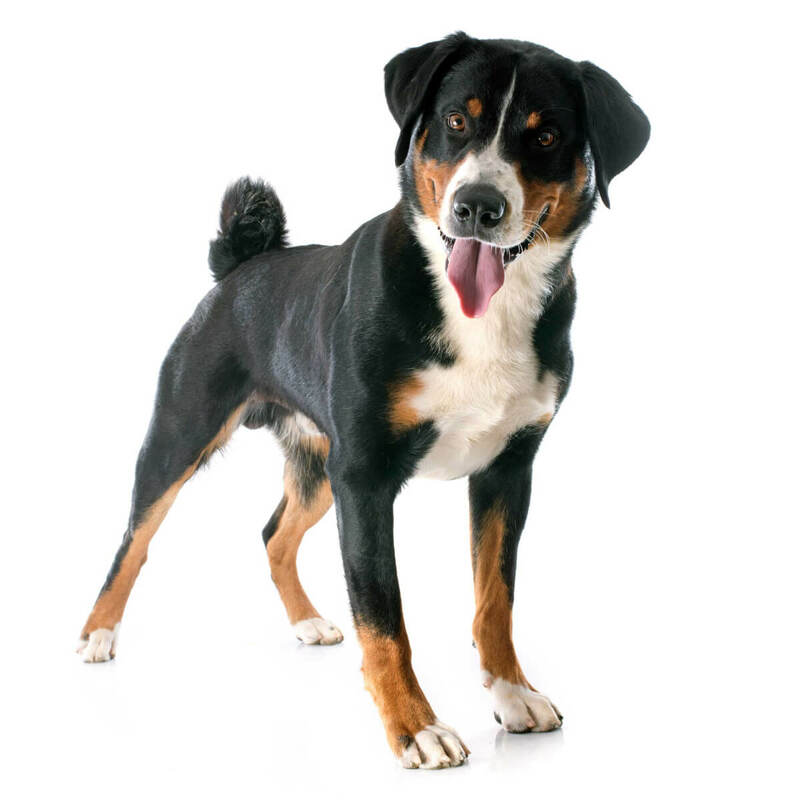 Appenzellers have a robust frame covered with a short and thick double coat. Their topcoat is shiny and has a glossy texture and covers a thick black, brown, or gray undercoat. Their head is wide and flat with small, dark eyes. Their ears are floppy and soft and fall forwards onto the cheek. The tail is carried rolled up on its back. The coat is colored black or brown and features symmetrical white and rust markings. A white splotch on the head and rust colored marking over the eyes must be present. Tan and white markings may also appear on the cheeks, chin, chest, and legs. Males reach a height of 22 - 23 inches and females are slightly shorter, reaching 18 - 20 inches. As adults these dogs will weigh between 49 - 70 pounds. 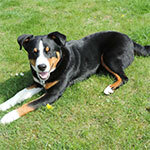 Appenzells are loyal, affectionate, brave, intelligent and energetic. These dogs will usually form a strong bond with one owner but will be loyal and respectful to all family members as long as proper training has taken place and the dog understands that it is lower in the pack hierarchy than humans. The Appenzell is used to working around animals and gets along well with other dogs, livestock, and household animals if it has been socialized while still young. These dogs have been watchdogs for centuries and may be apprehensive towards strangers, though they should not be aggressive. 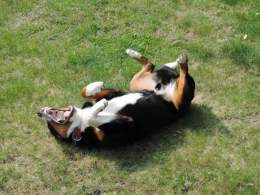 Barking should be expected, and socialization should be done to minimize this behavior. Dogs of this breed respond well to firm, calm training. They learn quickly, partly because they are quite smart, but also because they greatly desire to have a job or activity to perform. They enjoy the outdoors and thrive in a location that gives them a lot of open space to run around and play. It is imperative that this dog's owners be higher up on the pack hierarchy. Otherwise the dog may be hard to control and somewhat unruly. It is also very important to exercise this dog and stimulate it mentally and physically, especially if it is not employed as a work dog. Therefore it should be apparent that these dogs are not good for lazy or very busy owners, especially in an urban location. These dogs are caring and friendly towards children, but may occasionally nip at their heels as if they were livestock. Appenzellers are big and energetic enough to accidentally knock over small kids, so they should not be left alone unsupervised. These dogs will get along swimmingly with other dogs and large animals. If they are to be living with small animals socialization should take place at a young age to ensure a positive relationship. These dogs may be apprehensive towards strangers due to their guard dog nature. Some barking should be expected. Proper socialization at a young age is recommended. Below are pictures of the Appenzeller Sennenhund dog breed. These dogs require a medium amount of maintenance. Their coat is easy to care for and should only require a moderate amount of brushing to stay in good shape. However, Appenzells do shed, so some cleanup may be needed. 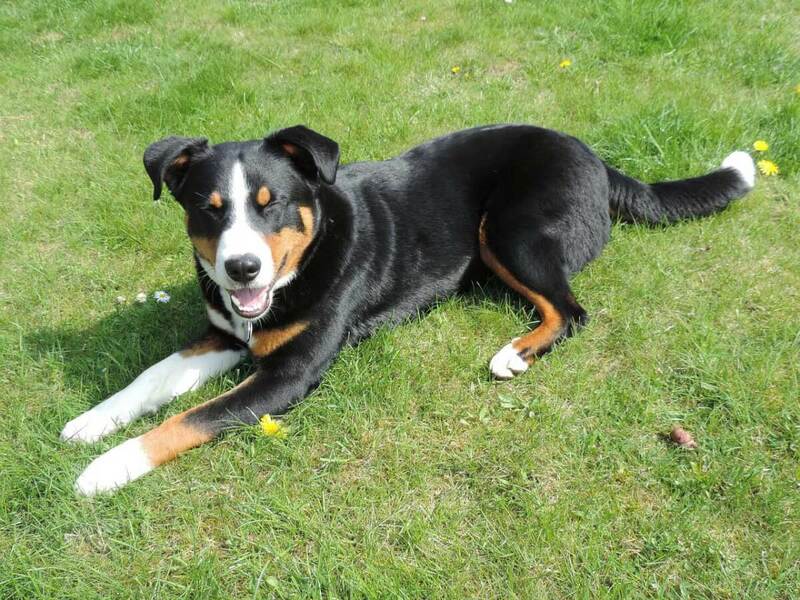 They are very active dogs and will needs a high amount of daily exercise. Brushing should be done at least 2 or 3 times a week, possibly more during shedding season. 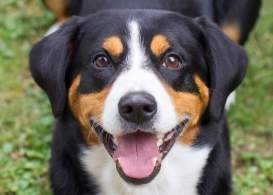 The Appenzell does not belong in an apartment or even a household in the suburbs if its owner is not very active and willing to jog or run with the dog on a daily basis. It is best suited for a ranch or farm where it has room to run. Its herding instincts will keep it from running off. It prefers to be outdoors and closely bonds with its territory. 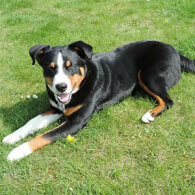 If it is not used as a working dog or properly exercised the Appenzell may engage in destructive behavior, barking, etc. If you can give your Appenzell a job and provide the leadership that it instinctively craves, it will be a happy camper. This breed is not a good fit for apartment life. These dogs prefer to live outdoors in a ranch or farm style residence with lots of land to roam. Appenzells that do not have this kind of space and are limited to say, a small yard, will need extra time spent on their mental and physical exercise needs. These dogs are known to bark, so they may cause trouble if neighbors are in close proximity. 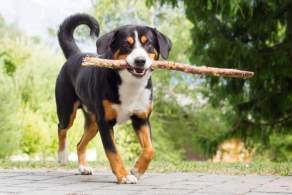 These dogs have a heavy double coat and are best suited for colder climates. They should not live in exceptionally warm environments, like deserts and tropics. Very few health studies have been performed on this breed, but what evidence there is seems to suggest that this breed is in good health and should not be subject to any hereditary diseases. The life expectancy is approximately 11 to 13 years.